The “big game” kicks off this Sunday and the masterminds behind the bar department at Carnival Cruise Line have created a pair of colorful cocktails inspired by the two teams competing for the coveted winner’s trophy. The hand-crafted cocktails – “The Pounder” and “The Charger,” inspired by the squads from Carolina and Denver, respectively – are the perfect complement for guests checking out all the exciting gridiron action being shown on board. Instructions: Pour all ingredients, except for Chambord, into a mixing cup with ice. Shake for at least five seconds. Strain into glass with fresh ice and add Chambord to release the team’s color. Garnish with pineapple slice. 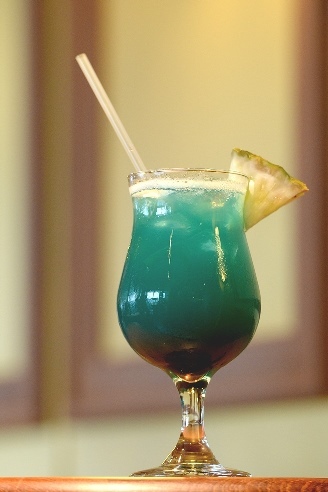 Instructions: Pour all ingredients, except for Blue Curaçao, into a mixing cup with ice. Shake for at least five seconds. Strain into glass with fresh ice and add Blue Curaçao to release the team’s color. 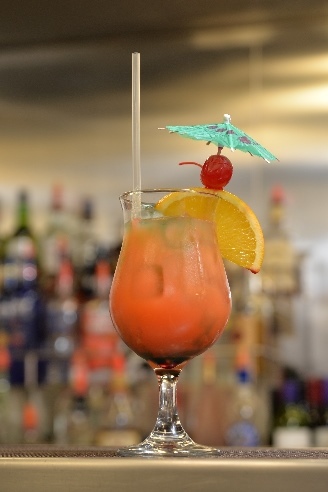 Garnish with orange slice, cherry and drink umbrella. In addition to the specialty drinks and discounted buckets of beer, Carnival has a number of fun activities planned for this year’s big game, including special trivia contests, a “sailgate” party with fun games and music. Guests will also have the opportunity to showcase their best touchdown celebration to win a prize.